Bacon Goddess: Starry Night - in BACON! I've been out-of-hand for a bit and sadly neglecting my bacon blogging, so I figured I'd return with something so delicious it will give you a whole new appreciation for art! Yes, this is Van Gogh's Starry Night... recreated in bacon! 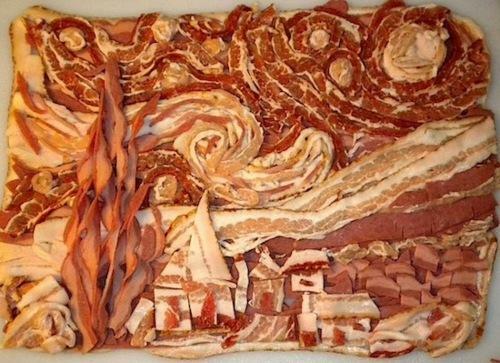 This Instructable by CopperTwist, entitled "Van Gogh for Breakfast", will run you through how to make your own Starry Night out of bacon. So artfully delicious! You know what's cool? People have seen this and been inspired to create their own bacon art! 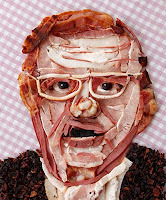 Chow Bella made a portrait of famous Arizona sheriff, Joe Arpaio. Here's a tutorial on how to make your own bacon art by Alexander Ross. Complete with a creepy bacon baby! Yep. My appreciation for art has grown a hundredfold today!